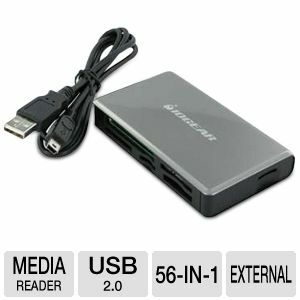 GFR281W6, IOGEAR's universal memory bank, 56-in-1 memory card reader/writer, is an ideal solution for high-speed, bi-directional image and data file transfer between your computer and multimedia devices. Images and data can be downloaded directly from your memory cards without using additional adapters. It works with all major memory card formats and supports high capacity. With direct USB 2.0 Hi-Speed file transfer from memory cards used in your digital cameras, cellphone, or MP3 devices, you can save time and conserve power on devices. It also instantly transfers your slotMusic songs to your PC or Mac. No matter where you go, IOGEAR's universal memory bank helps you to easily bring your digital images and data with you.